Dan Jauregui as Boltman, shown with young fan, said he regrets not yet being able to share half the proceeds with Rady Children’s Hospital. Photo via Dan Jauregui. Unfortunately, the Boltman eBay auction did not meet the set reserve price and was not sold. The highest bid received was $71,600. I understand to some fans, this may seem like a lot of money for a mascot character. However, if I were to have accepted this bid it would have negatively affected me financially. With 50 percent of the potential winning bid dedicated to Rady Children’s Hospital San Diego, the net proceeds after all taxes and fees would have been roughly $20,000. After over two decades and investing over six figures, it would not have been a wise choice to sell at that price. 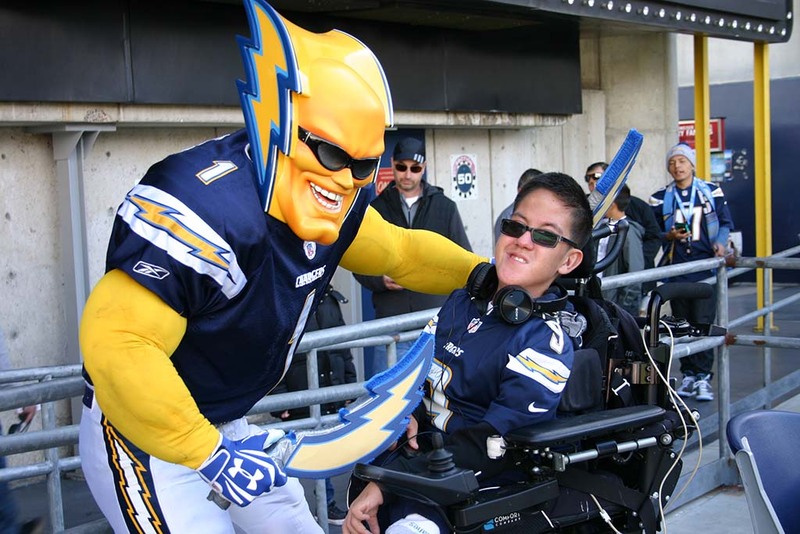 Playing the role of the unofficial mascot Boltman on game day was never meant to be a for-profit endeavor. It was simply a hobby that incurred a tremendous amount of expenses to keep it running for over two decades. The expenses of maintaining the character proved to be difficult without corporate sponsors. Many of you want to know what the reserve amount on eBay was set at, but to have disclosed that dollar amount would have been foolish for anyone with this type of eBay auction. The reserve amount that was set will remain confidential. Only Boltman knows the reserve amount, and he’s not talking, sadly to say! Another popular question I received was “What is Boltman’s monetary value worth?” To figure that out, you would have to do an appraisal comparison to other NFL team mascots that were made but where unestablished prior to being sold to an NFL team. This research has been done and they can average from $80,000 and higher depending on the manufacturer contracted out to do the job. 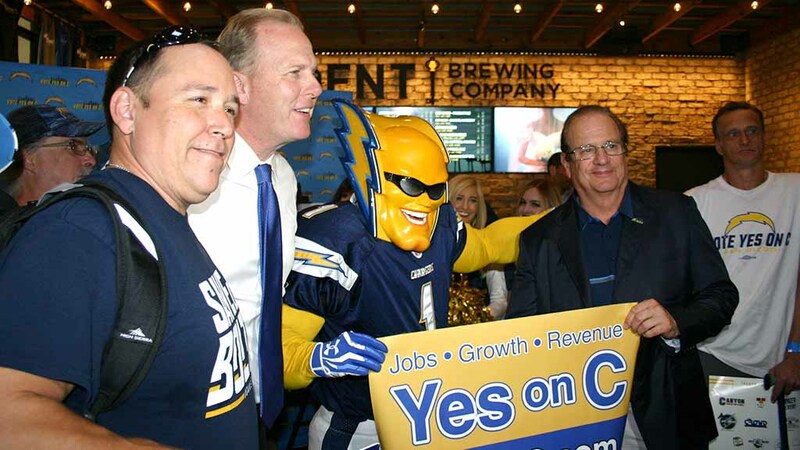 To be fair, Boltman is not the official mascot for the Chargers. Technically, however, he has played that role, for whatever that’s worth. Another way to establish brand value is the public awareness and perception of the character. 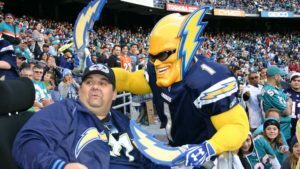 Boltman was the face of the San Diego Chargers at home games in Qualcomm Stadium for over two decades. He is well recognized by Chargers’ fans around the country. Boltman’s intellectual property protection with his trademark and copyright on the character are invaluable for anyone looking to make a lucrative business on it through marketing and merchandising in Los Angeles and keep the Boltman legacy alive. This is a great opportunity that Chargers’ owner Dean Spanos has missed again. It would have also been a great public relations move on his part. Some have questioned my motives for putting Boltman up for auction. I went into this with full intentions of donating half the proceeds to my favorite charity, Rady Children’s Hospital. I also went into this eBay auction knowing that I would lose more than 80 percent of what I’ve invested into Boltman over the past two decades if I had met my reserve. This was not an easy decision, however. I wanted to keep Boltman’s iconic sports character legacy alive in Los Angeles and in the right hands. I did not want it to fall into the hands of someone who would utilize the character against the Chargers by defaming the Boltman character in public. Naturally, my first choice was the hopes of the Chargers picking it up. However, when has Chargers’ franchise owner Dean Spanos done anything right for the fans, or the community it plays in? There’s your answer, sadly to say! Ruling out what I have invested, if the price was so low that anyone could buy it and do whatever they want with Boltman, including defaming the character, this would directly affect the Chargers as it’s heavily branded as the Chargers’ mascot whether the Chargers franchise accepts this realty or not. If you don’t believe me, Google who is the mascot for the Los Angeles Chargers, and Boltman will come up everywhere including images. This cannot be changed, which is more reason to be careful of it getting into the wrong hands. In the wrong hands, this could be embarrassment to myself, the city it represented, San Diego and the Chargers. This was not a chance I was willing to take. My apologies to the fans who continue to support the Chargers and Boltman going to Los Angeles. My intentions were very pure in doing this. I was truly looking forward to handing that check over to Rady Children’s Hospital with the winning bidder on the eBay auction and doing one last round with the kids before calling it quits. For now, I will dedicate some time and try to find a perfect home for putting Boltman on display where fans can still get that crazy pic they’ve always wanted but never had the opportunity to get. Please feel free to openly comment on where you think would be the best place to put Boltman on display to keep the legacy alive. In the meantime, I am still open to the possibility of any companies in San Diego or Los Angles, that would like to discuss the purchase of the Boltman character outside of an auction and still give 50 percent of the proceeds to Rady Children’s Hospital as originally planned. I encourage anyone interested to contact me. Perhaps there could still be a positive end to this story. Dan Jauregui of Ramona was the “No. 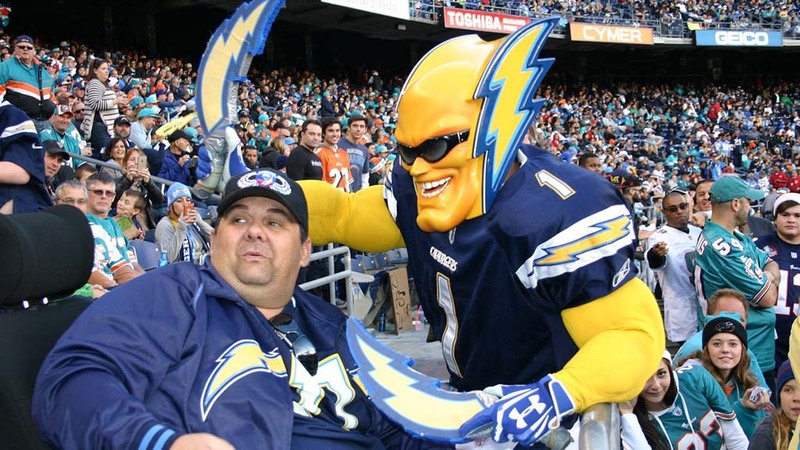 1 Chargers fan” for more than 20 years, wearing a succession of Boltman costumes. The eBay reserve price policy — for a hidden minimum cost — is detailed here.